Data is the Answer: Will You Be the Disrupter or the Disrupted? To become an innovator in banking and disrupt the status quo, financial institutions must shift to a data-driven mindset, with a relentless focus on putting the customer first. Join Don MacDonald CMO, MX and Ivan Hurtt Product, MX for our webinar "Don’t Let Apple Take a Bite Out of You: Compete Against Big Tech" this Friday, March 29, 2019. Learn how you can leverage your data to create a truly exceptional customer experience and compete effectively against the big tech giants. Most financial institutions have siloed customer data all across their organization—making it hard to access and nearly impossible to act on. Join Dan Ries, Product Manager at MX, for our webinar: A Data-Driven Approach to Really Knowing Your Customers on Thursday, March 7th at 1:00 P.M. EST to learn how you can leverage your data to strengthen engagement with customers, boost adoption among new users, and drastically increase ROA. With unprecedented choice and virtually no friction, consumers can easily switch to data-savvy competitors or big tech companies for their financial needs. Financial institutions that effectively use data to increase revenue, reduce cost, and deliver truly amazing customer experiences will win new customers and drive ROA. Financial stress can drastically impact employees’ wellbeing and work performance. In fact, a recent report revealed that 60% of employees facing financial issues were unable to focus during work. Financial institutions are well positioned to help employees manage their finances more effectively with the right education, tools, and guidance. When employees are financially stronger, they become advocates that can help your members make well-informed decisions about their financial goals. Strengthening your members’ financial literacy, strengthens your credit union as a whole. Data-driven member advocacy is the new standard for success. In this webinar you'll learn how data can help you become member-obsessed, what steps to take to maximize your member advocacy, and why there's no better time than right now to pivot your business model to be data first. At MX, we set the bar for data cleansing and classification higher than anyone else on the market—because 50% cleansed data is simply not good enough. We help fintech innovators act on their data quickly, so they can spend less time cleansing transactions and more time executing on strategic initiatives. Join Mike Bates, Product Manager at MX for our webinar The Importance of Data Quality in the Digital Age on Thursday, December 12th at 1:00 PM EST. The quality of your data is directly related to the success of your business. When your data is properly cleansed and accurately classified, you’ll power better user experience, insights, and data analytics. Traditionally, the financial industry has been primarily focused on shareholders’ wealth over consumer advocacy. Today, we’re seeing a shift in the financial industry—well-funded startups and big tech innovators are winning consumers’ hearts by using data to promote advocacy and deliver better experiences. Overall, there are two main trends that are driving change: increase consumer choice and decrease in friction to change. To become an innovator in the space and disrupt the norm, financial institutions must shift to a data-driven mindset—inherently focusing on consumer obsession and putting the customer first. You’re sitting on a goldmine of data—it’s time to convert it into ROI. Business as usual will be anything but in 2019—so if you’re planning on growth in the next year, you need a data-driven strategy. With unprecedented choice and virtually no friction, your customers can easily switch to data-savvy competitors or big tech solutions for their banking needs. Leverage all the insights you’ve gained by acquiring customers to become the primary financial institution. Financial institutions that effectively use data will increase revenue, reduce cost, and deliver truly amazing customer experiences—winning new business and driving growth. How are Amazon, Apple, and Google winning consumers’ hearts and minds? With data. - How to identify consumer trends and become an innovator in the marketplace. Small and medium-size financial institutions are under attack by big tech companies and large financial institutions. Data-driven, consumer advocacy is how the big players are winning the customer engagement game—and how you can too. With unprecedented choice and virtually no friction, your customers can easily switch to data-savvy competitors or big tech solutions for their banking needs. It’s time to leverage all the insights you’ve gained by acquiring customers to become the primary financial institution. -Banking hasn’t historically been as involved in the financial wellness and sustainability aspect that’s trending now. What’s driving that change? -Where do you see the industry in 3-5 years? -What difference is the younger generation having on banking as consumers/employees? -How can government help consumers with better financial management? Consumers’ expectations for simplicity and convenience is at an all time high. To meet these growing demands, financial institutions must embrace AI-driven messaging applications and voice-activated devices. And it all starts with clean data. Without clean data, chatbots can’t answer basic questions and AI is anything but intelligent. Leverage the learnings from Mercantile Bank of Michigan to find out how your financial institution can use AI-driven technology to successfully drive customer engagement and loyalty. Join Keith Armstrong and John Schulte to find out how they use AI technology to increase engagement and reach new customers. In a changing world where 50% of home loans and 38% of auto loans are provided by a non-FI, how do you compete? The answer lies in how you collect, analyze and act on data. James will walk you through how to lay the foundation for an AI-driven approach to big data. James Dotter, Chief Financial Officer at MX, brings more than 16 years of management experience and financial expertise with industry-leading, billion-dollar technology companies. Previous to joining the MX team, Dotter managed finance and operations at InsideSales.com, one of the fastest growing tech companies in the US. He led InsideSales.com through five years of more than 100 percent revenue growth, directed talent acquisition of more than 100 employees per quarter, and raised more than $140 million in private equity financing, while building and maintaining strategic partnerships. 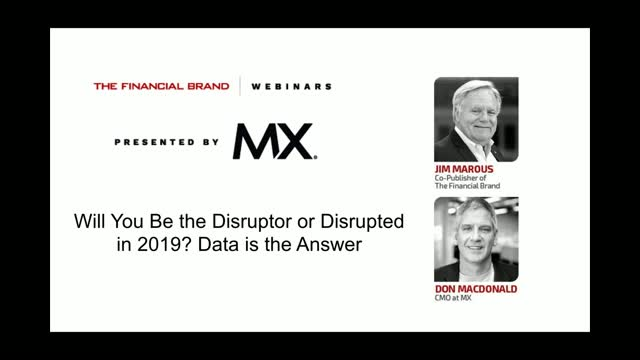 Come join the conversation with Don MacDonald and Jim Marous as they discuss the Digital Banking Report and the rich information it provides on how to survive in the data age. It’s all but a foregone conclusion that financial institutions need to make the transformation to digital. In fact, many have already made huge strides and have become digital-first. But, once you’ve made the transformation, there’s a huge difference between having and using data. Online banking providers often serve as the financial hotspot for account holders today. So how can banks and credit unions join forces with these providers to make the most of the age of analytics? Don Parker, EVP of Partnerships at MX, tells what you need to know to bring these partnerships to a new level. Gartner estimates that over 60% of big data projects "will fail to go beyond piloting and experimentation." How do you ensure your projects are part of the 40% that succeed? Better yet, how do you ensure you're in the top 10%, so you edge out your best competitors? In this webinar, Brandon Dewitt, CTO at MX, will outline what it takes to launch from a place of vision rather than delusion — resulting in successful data-oriented projects again and again. With these principles soundly in place, you'll easily outshine your competitors and exceed user expectations. Many analysts across various industries have said that data is the new oil. And yet financial institutions are sitting on billions and billions of datapoints and often don’t know how to put them to use. Join James Dotter, CFO at MX, to see how to get real revenue gains from the data you already have on hand as well as from data that’s easily within reach. The digital transformation has laid the foundation for the most important stage in banking's history — the age of advanced analytics. Join Don MacDonald, CMO at MX (former CMO at Intel), as he discusses the opportunities in this new age and what you can do to win the future of banking. How do you use data to exceed user demands? Join Erin Caldwell, Director of Client Education at MX, and John Schulte, CIO at Mercantile Bank, to see what it takes to better leverage your data and exceed user demands. - How Mercantile Bank uses AI and data analytics to improve the user experience. - How to maximize every touchpoint with relevant, targeted marketing campaigns. - How to use data to win long-term user loyalty and drive up ROI in the process. MX puts a user’s data on center stage, molding it into a cohesive, intelligible, and interactive visualization. As a result, users engage more often and more deeply with your digital banking products. Title: Data is the Answer: Will You Be the Disrupter or the Disrupted?